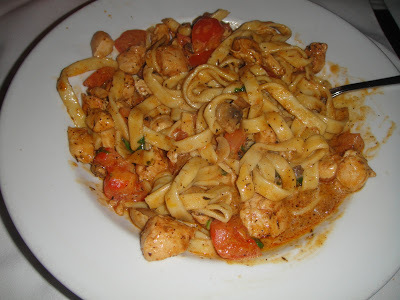 One of my favorite pasta dishes of all time is at a cozy and charming French bistro called Cafe Bizou. The Cafe Bizou that I have been going to for years is on Ventura Blvd. in Sherman Oaks, but there are two other locations: one in Pasadena, CA, and the other in Santa Monica, CA. Growing up, everytime my family would meet my grandparents for dinner, we would go to Cafe Bizou. The owner of the restaurant is a French man named Philippe. He is the nicest man and goes out of his way to make sure everything is well taken care of. He always greets me with the warmest welcome and asks about my family everytime I come in. Cafe Bizou has great food and great service for a ridiculously good price. It’s Cheesecake Factory prices with 5 star quality food. It’s a hidden gem- not many people my age know about it, but it is very popular amongst a more elderly crowd. Usually their diners have been loyal customers for many years. You can’t go wrong with anything you order here. There is also only a $2 corkage fee if you want to bring your own wine, and you can add a soup or salad to any meal for only a dollar extra. There are a few dishes I recommend, but one in particular is truly exceptional. I LOVE the spicy chicken fettucine. For $14.95, you get a very generous portion of one of the best pastas ever! This pasta is so flavorful and has a spicy cajun kick to it. It comes with tomatoes, mushrooms, and chicken with a creamy cajun sauce that is so delicious. I love that its a cream sauce with a spicy cajun kick to it, and the mushrooms, tomatoes and basil soak in the sauce and every bite is the perfect bite with so much flavor. This has got to be my favorite pasta dish. I usually don’t order anything else when I go because I love it so much. Back in the day I used to always order their Lobster Pasta which is excellent. But after I tried the Spicy Chicken Fettucine, I have never looked back. I still recommend it though because if you like lobster, it is a good pasta. They have a great lobster bisque AND a french onion soup! Also an amazing seared ahi tuna appetizer. Everything is delicious at Bizou, I’m tellin’ you! Also, they have a killer Chilean Seabass featured on a special day of the week! If you like fish, I highly recommend this dish. It’s seabass atop a bed of vegetables and eggplant in a lemon butter sauce. It’s flaky and melts in your mouth. Anyway, if you are reading this, go to Cafe Bizou. It is one of my favorite restaurants and for what you get, the prices are very reasonable. It is a great French Bistro with a romantic, cozy vibe, and the food is absolutely delicious. I’ve never ordered a bad thing there. It doesn’t look pretty anymore because it’s half eaten (sorry! lol). It’s a good one! Here are two old school pics of my family and I at Cafe Bizou. It’s been a family tradition for years.